Mama Mia, it's pizza time! 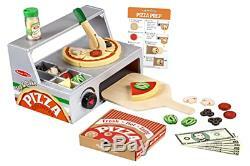 Create fresh-baked pizza, made to order, with this deliciously unique 34-piece pizza making set. Start with felt sauce and cheese on the wooden Crust, choose from wooden toppings (pepperoni, olives, mushrooms, and peppers), then "bake" in the pizza oven built in to the storage and serving counter. 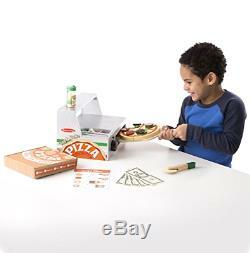 Pieces stick together with self-stick tabs and can be sliced with the rolling wooden cutter. 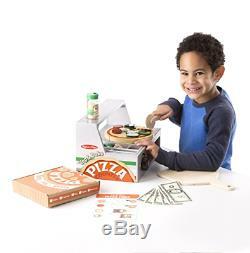 Create made-the-way-you-like-it pretend pizza with 34-piece wooden play pizza-making set with counter/pizza oven. 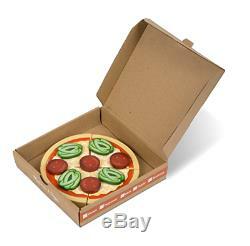 Ingredients include cheese shaker, felt sauce and cheese, wooden Crust, toppings; pieces stick with self-stick tabs. Great for developing counting, sorting, imaginative play, storytelling, and fine motor skills. Ages 3 years and up. 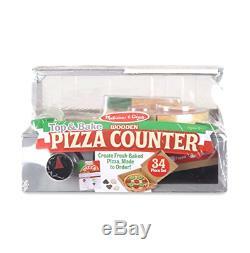 The item "Melissa & Doug Top & Bake Pizza Counter Role Play Food" is in sale since Monday, October 30, 2017. 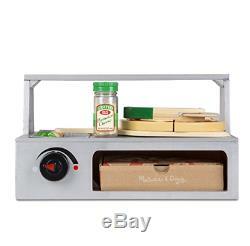 This item is in the category "Toys & Hobbies\Preschool Toys & Pretend Play\Wooden & Handcrafted Toys". The seller is "aronkorn" and is located in Spring Valley, New York.